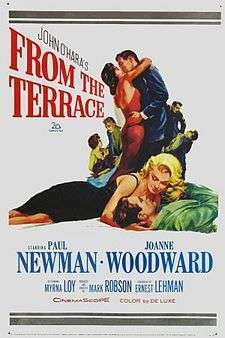 From the Terrace is a 1960 American drama DeLuxe Color film in CinemaScope directed by Mark Robson and starring Paul Newman, Joanne Woodward, Myrna Loy, Ina Balin, George Grizzard and Leon Ames, with a young Barbara Eden appearing in one scene. This was the third movie real-life spouses Paul Newman and Joanne Woodward made together. In 1946, David Alfred Eaton (Paul Newman) returns home from the war to Philadelphia. He finds his mother Martha (Myrna Loy) driven to alcoholism by years of neglect and abuse from her husband Samuel Eaton (Leon Ames), owner of a prestigious iron and steel company. Having withdrawn from his family after the death of his firstborn son thirteen years earlier, Samuel's resentment drove Alfred to turn his back on the family business and strike out on his own with his closest friend, Lex Porter (George Grizzard). While attending a party at the estate of Lex's wealthy uncle, Alfred is dazzled by Mary St. John (Joanne Woodward), the daughter of a wealthy family. Mary is drawn into a relationship with Alfred and breaks off her secret engagement to Dr. Jim Roper (Patrick O'Neal), defying her parents. After a humiliating argument, Alfred's father falls ill, and Alfred shuns the family business once again to start an aviation company with Lex. One wintry day, Alfred and Mary are driving home from a party when they see a little boy fall through the thin ice of a frozen pond. Alfred plunges into the icy waters to save him. The boy's grandfather, James Duncan MacHardie (Felix Aylmer), the most famous financier in America, invites Alfred and Mary to dinner. MacHardie, a shrewd businessman, sensing Alfred's drive and ambition, offers him a job in his investment firm. Obsessed by the need to outdo his father, Alfred travels the country for MacHardie, leaving Mary alone for months at a time. Lonely and self-pitying, Mary begins to resent Alfred's constant absences. Creighton Duffy (Howard Caine), MacHardie's son-in-law, whose position is threatened by Alfred's acumen, suggests that Alfred spend two months in rural Pennsylvania checking out the business aptitude and prospects of Ralph Benziger (Ted de Corsia), a prosperous coal mine owner. After an ugly argument with his wife, Alfred goes to Pennsylvania. Invited to dinner at Benziger's home, he meets the man's beautiful and compassionate daughter, Natalie (Ina Balin). Lonely and overwhelmed by her sensitivity, Alfred impetuously invites her on a date, but she refuses because he is married. Later that night, however, Natalie reconsiders and arranges to meet him at a drive-in movie the following evening. Alfred confides to Natalie that her warmth and generosity has made him realize what a sham his marriage is. They share a kiss but Natalie still believes they must end this relationship before it goes any further, for both their sakes. Upon returning to New York, Alfred is immediately summoned to MacHardie's office. He is informed that Mary has been having an affair with Dr. Roper. But the archly conservative MacHardie proceeds to warn Alfred that he will not tolerate divorce within his firm, considering it a failure in the employee's character. MacHardie also assigns him to analyze the Nassau Aircraft Corp., his former firm, as a possible investment. One night, while leaving a party with his wife, Alfred unexpectedly encounters Natalie in front of the hotel. Sensing that Alfred and Natalie were intimate, Mary vindictively calls Roper and makes a date with him. Alfred goes to meet Natalie and tells her that although he is estranged from Mary, his career prevents him from requesting a divorce. Alfred begins to investigate Nassau Aircraft's business practices. Duffy, who has become unethically involved with Nassau and will reap a financial windfall if MacHardie invests in the company, threatens to blackmail Alfred unless he suppresses his report. Alfred and Natalie find themselves unable to resist their attraction to each other and a tryst in a hotel room ensues. Photographers hired by Duffy burst in and capture their indiscretion. Natalie, uncertain if Alfred's main concern is to save her reputation or his career, decides to leave. Mary, meanwhile, suggests to her husband that they share an open marriage, seeing whomever they please. After she seductively retires to her bedroom, the scandalous photos are delivered to Alfred at his home. At work the next day, MacHardie ushers in Mary to celebrate Alfred's surprise promotion to partner. Duffy smirks, only to see Alfred rise and denounce MacHardie's hypocrisy of placing success and social position above personal responsibility and happiness. Alfred then issues the uncensored report exposing Duffy's duplicity and walks out. Mary runs after him, but it is too late. He leaves her for good and returns to Natalie's home and a new life. Wikimedia Commons has media related to From the Terrace (film).